What's happening with these markets?? The markets in recent weeks have seen dramatic fluctuations, but in most of our diversified client portfolios, fluctuations were minimal (depending on how much was in high risk funds or stocks). The main cause of the market fluctuations has been attributed to the market correction in the tech sector, which was largely inevitable (see Mutual Fund Reporter, Issue 157). As always, though, predicting tomorrow's market moves is largely a mug's game, focusing on building an appropriate portfolio is what matters in the long run. Diversification has always been a key tool to minimize risk and maximize returns within a portfolio. There are many ways we accomplish this. Mutual Funds can be used in this process, as they allow for maximum diversification without having to pay commissions to buy several different stocks. Funds also save you the time required to then monitor the stocks. Mutual Funds offer many different ways to diversify. One way to diversify is by investment style. A mutual fund manager can focus on growth stocks, value stocks, a specific sector or a blend of stocks. For the first time, our investment options listing includes a column describing the management style of a particular fund. A growth fund would focus mainly on the up and coming high growth stocks to add to their portfolio without paying as much heed to the valuations in relation to earnings. Value managers focus on buying companies that are undervalued and not on trading at a high ratio to earnings. The fund manager could also use what is called �top-down' or �bottom-up' management style. Top down management is where the manager looks at the industry from an economical perspective primarily and how the sector or sectors are doing as a whole. A bottom-up investment style focuses more on the fundamentals of the specific companies they are buying into. Your account's risk factors are also a way to diversify. Having your portfolio divided between high, low and medium risk funds depending on your risk tolerance as well as taking into consideration how near you are to retirement are very important. 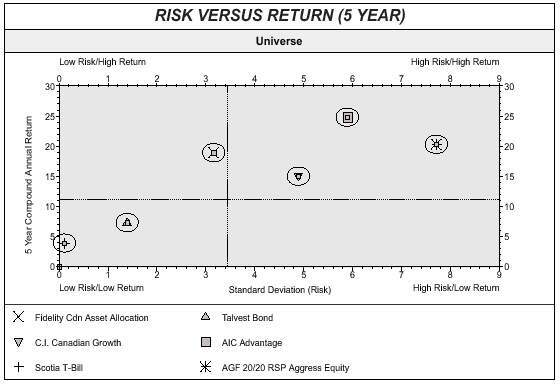 Below we have a graph that shows the relation of risk relative to return of some of the mutual funds that we offer. In short, the more risk that is taken, the more likely that returns of a more aggressive portfolio will exceed returns of a conservative portfolio in the long term. The fund managers will usually have a portfolio bias where they focus on Small Cap/ Mid Cap/ or Large Cap Companies. Small Cap refers to the size of the market capitalization of the companies in the fund. Some fund managers will have no bias for the fund and will hold a mixed portfolio. The size of the market capitalization is also directly related to risk. A large cap mutual fund would be lower risk than a small or mid cap fund. An example of large cap fund holdings would be companies such as BCE or one of the large Canadian banks. ScotiaMcLeod continues to recommend an overweight position in financials. Bank valuations are extremely attractive and fundamentals are compelling. We expect the bank group to continue to internally generate capital at a healthy real rate under a number of difficult scenarios. Positive earnings surprises developed in the first quarter, with earnings expected to meet or exceed expectations over the next year. In addition, we expect interest rate fears to moderate. As a consequence, we believe bank share performance, after two difficult years, has the potential to provide strong absolute and relative returns. The bank sub-index has been building a very solid base in the past two years. Small cap stocks in Canada, whose performance is measured by the SPTSE Small Cap Index, have recorded a 4.7% price return since the beginning of the year. Despite this fairly good performance, these stocks continue to underperform the large cap stocks, which recorded a 14.7% increase over the same period. As it has now been the case for several months, many small cap companies have problems showing positive EPS growth. Therefore, we continue to recommend that investors stay cautioned and focus on companies that show a high quality of earnings and a solid potential for growth in their respective sector. We recommend an underweight in this sector. Prospects for long-term growth are good, but we are concerned with valuations across the sector. Technology company valuations are still well beyond all traditional measures. Our overall sector view suggests caution is warranted. Global Strategy has introduced a new balanced fund: Global Strategy Growth & Income. Due to the C.I./BPI merger, there have been several name changes. Many funds that were under BPI or Hansberger have been renamed under the C.I. heading or under the Signature heading. Switches between funds are now available.